Do I have to cook my moose meat to well, or can I cook it to medium or medium-rare? Trish, there are two things to know about cooking moose meat that will save your day. Don't Overcook the Moose Meat! Overcooking moose meat will turn it into some along the lines of shoe leather... very tough. 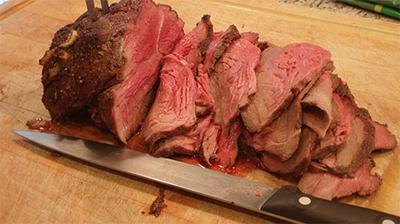 For a conventional moose roast we cook to rare to medium well depending one who we are serving. We never (intentionally) cook to well done. Even when we cook moose burgers, we cook till they are still juicy with some pink juice still in them otherwise you'll end up with hockey pucks. If your guests just can't stand the sight of even a tiny bit of pink in the moose meat, I suggest cooking in a slow cooker. Add a cup or so of water and a slash of red wine. Cooked on low for 8 hours, the moose roast will be cooked all-the-way-through and will fall apart using just a fork. The second thing about cooking moose meat is to treat it just like beef. Yep, cut it and cook it just as though you were cooking beef. Seriously, there really is no mystery to cooking moose. The only downside to moose meat (if you want to call it that) is the very-low fat content of the meat. I recommend using/adding some sort of moisture to the cooking of roasts, which means cooking in some sort of covered pan or pot. Wrapped with bacon or adding moisture makes an amazing moose roast. My wife on the other hand prefers to cook her moose roast recipes in an uncovered cast iron skillet in the oven. To-each-their-own. Moose meat is the best meat on the planet. Harvest a moose and you will have enough hormone free wild game meat to feed your family for an entire year. A family of four can likely get enough meat from a have a moose. Share the meat around to your appreciative friends and family too. Be sure to check out the moose recipes page for more recipe ideas from us and site visitors like you. I like to cook low and slow. Moose roasts, season with yellow mustard (French's) add a rub all over, wrap in bacon, inject with butter. Yes butter. Do not overcook.. put vegetables on the bottom of the roasting pan instead of a rack to sit the meat on. I like to smoke moose roasts using the same recipe.